Preparing the vegetables – Peel the vegetables and separate the cauliflower and broccoli into small stems. Cut the carrots into batons. Cook the vegetables separately in a pan of salted, boiling water until tender. Set aside in each case and leave to cool. Seasoning – Peel and finely slice the ginger, and finely chop the tarragon. Transfer the cooked vegetables to a frying pan and toss in olive oil together with the ginger. To serve – Place the vegetables in a large serving dish, sprinkle with fleur de sel and freshly milled pepper, a drizzle of olive oil and garnish with chopped chervil. The vegetables can be served cold with some soy sauce and roasted sesame seeds. 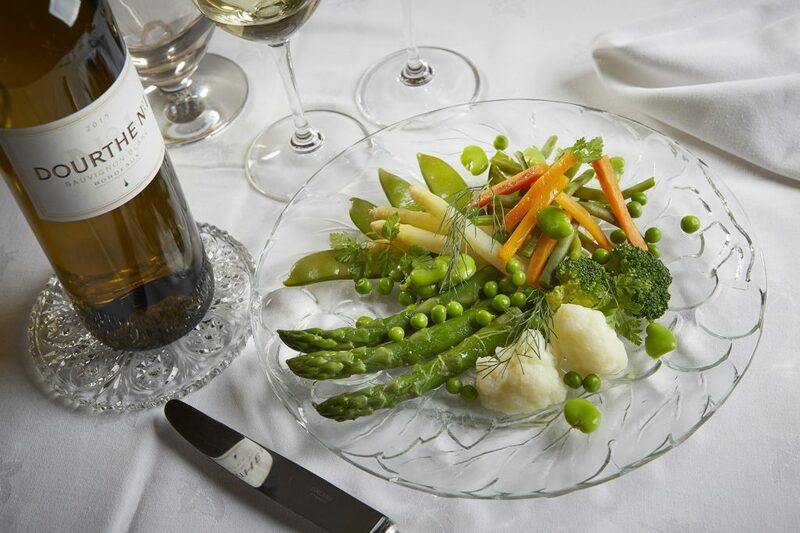 This dish will perfectly fit Dourthe N°1, Bordeaux Blanc, which citrus and exotic fruits aromas as well as liveliness, will perfectly ally to the mixed flavours and the vegetables freshness.